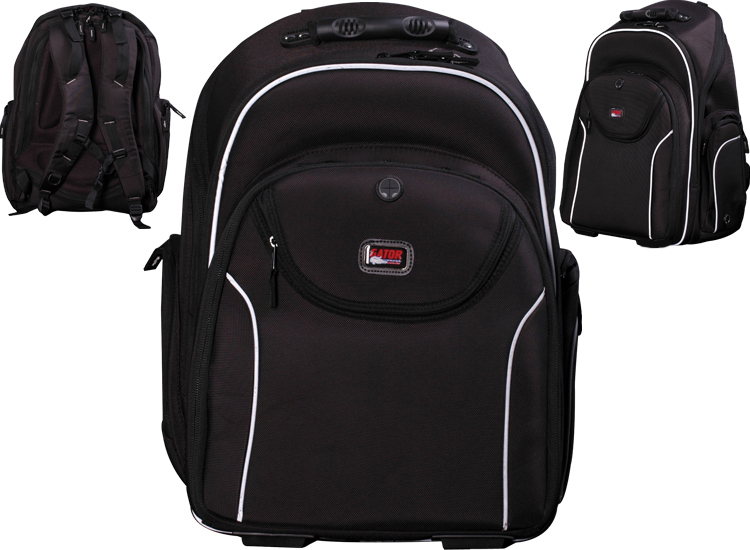 The Gator G-Media Pro BP is the ultimate backpack for your mobile recording rig. It sports pockets for your interface, hard drive, mixer, and cabling. In fact, there's an integrated Velcro cable management system, so you can everything tidy as you travel. The G-Media Pro BP also has a heavily padded laptop pocket and an MP3 player pocket with run-throughs for headphones, so you can listen on the go. And there's even a pocket with a custom-fit raincoat for the G-Media Pro BP. You've got tons of room for all of your essential recording gear with the Gator G-Media Pro BP. This deluxe backpack was purpose-built for just that, boasting pockets for an audio interface and an external hard drive. What's more, there's a section for an audio mixer or a projector - and you can even fit many 25-key keyboards into the G-Media Pro BP. Recording a show? Bringing a rig to work, so you can get creative on your lunch break? Want to capture a jam session with friends? The G-Media Pro BP is your one-stop solution - it's stylish, it's big, and it's purpose-designed to protect your important recording gear. With Gator's G-Media Pro BP, you don't need to bring along an extra laptop case. This backpack features a special, heavily padded storage compartment to protect your computer as you take it with you. Taking cabling anywhere can be a headache - even if you have cable ties, it's easy for things to get tangled up with each other when you stuff everything into a typical bag. That's why Gator gave the G-Media Pro BP a special cable pocket. It features an integrated Velcro cable management system, so that you can stay organized and free from cable-untangling frustrations. The Gator G-Media Pro BP provides your gear with a lot of protection, thanks to its heavy-duty reinforced nylon exterior and nylon interior. But with its padded backstraps and convenient handle, it's also comfortable for you to carry. There's even a breathable ventilation channel to keep your gear cool as you tote it along. Weather conditions are always a challenge when you're taking your gear with you on the road. Most backpacks and bags for gear are rain-repellant - but if you're caught in a downpour, they may not hold up. Gator takes the worry out of it with the G-Media Pro BP. There's a special pocket on the bag that includes a custom-fit raincoat. Just pull it around the bag, relax, and get to wherever you need to go - you may be wet, but your gear will be safe. The G-Media Pro BP's got you covered with a few cool extras to carry other items you're likely to have with you, beside your mobile recording rig. There's a special pocket for an MP3 player - and it also has run-throughs for your headphones so that you can rock out as you get to where you're going. Plus, there's a keychain holder so that you can safely keep your keys where you can find them later.